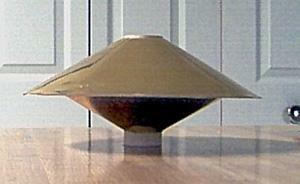 This is a review of Art Applewhite's newly released "Delta" saucer, which flies on 24mm motors. The main difference between his Delta saucers and his standard line is that there are no fins, and both the top and bottom shrouds extend to the motor mount. This makes them simpler to construct, less expensive, and fly higher than the standard saucers. My Delta saucer came nicely packaged in a food saver type sealed bag. The saucers were packaged in the shipping box with large plastic bubbles also made with a sealing machine. The three pages of instructions for the Delta saucer are well detailed and include lots of photos. Construction of this saucer is really simple. You first cut out and form the top and bottom shrouds. On this small saucer, I found it difficult to cut the launch rod holes with scissors so I used an Exacto knife for these cuts. You then cut out the center plate from the pre-marked foam board. There is an inner mark around the outer rim, where you only cut through the top layer. You then form a bevelled edge by cutting at about a 30 degree angle and sanding the edge smooth. Assembly consists of gluing the top shroud to the plate, adding the motor tube, and finally the bottom shroud. You must ensure that you align the launch rod guides on all three components. Also, make sure that the motor mount extends through the front shroud so that no paper overhangs the end of the mount. On a home-grown paper saucer, I left some overhanging just a bit, and the gasses from the motor charred the paper, leaving a hole in the front. On Art's saucers, there is typically no finishing required, other than sealing the printed cardstock with a clear coat. Note that the gold saucer uses metalized card stock and no clear coat was required. I cannot say enough about this mirror gold card stock. It is both beautiful and is a little thicker than most, making for a nice sturdy feeling saucer. The photos I provided do not do it justice. 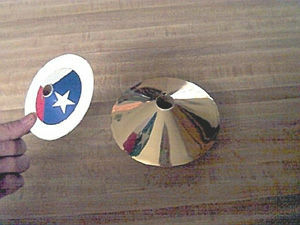 In the one attached photo, you can see the reflection of the smaller Texas Special reflected in its finish. In the instructions, Art says that you shouldn't fly these saucers in winds over 10 mph. This weekend the winds were over 10 mph, and several days of rain had left the field a swampy mess. The latter at least made saucers a perfect choice, as the area surrounding the pads was high and dry. And hey, if I've driven almost 2 hours to a launch, I'M GONNA FLY SOMETHING. :-). I flew this saucer off a 3/16" Estes rod. It was a bit wobbly on the way up, but just like the smaller Delta the trajectory was almost perfect. I am anxious to try it on an E9 with calm winds. The wind caused the saucer to tumble end-over-end on the way down. Nevertheless, the recovery was fine. When I was going to rate this rocket, I almost began feeling bad rating all Arts products so highly. There is no distinction between the different models if you go by my ratings. Finally, I decided "what the heck?" They all are relatively easy to build and fun. The Deltas are easier than the others are, but I have no problems cutting fins. My guidance to the buyer is: buy the size you think you would like for the motors you want to use and buy the style you find most pleasing (Standard vs. Delta, and the pattern/color). Finally, I'll repeat how much I liked the mirror gold paper. I recommend you select this option! This is a quick, easy build. It took one evening to build it. The instructions were clear and easy to follow. My only concern was that it was difficult to line up the launch lug holes. I've flown it twice now. C11-0 is a fast flight, almost too fast to enjoy it. The D11-P is a much more satisfying flight. I fly over hard ground, though, and the rocket descends quickly on the plugged motor. It dented the paper shroud a little. Excellent rocket. UFOs are fantastic demonstration rockets for school yard flights. Lots of noise, interesting looks, and a very safe and steady flyer.